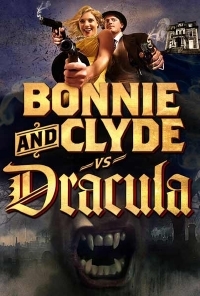 Bonnie and Clyde vs. Dracula is less a throwback to good old AIP drive-in flicks from the 60s than it is a throwback to straight-to-video Troma films of the 90s. I know that probably sounds like good news for you Troma junkes looking to view a micro-budget indie that re-captures the glorious goofiness of something like Redneck Zombies, but unfortunately B and C vs. D doesn't have the same reckless abandon as those early underground movies and fails to push the envelope, winding up a somewhat fun, but mostly dull, film that doesn't really deliver on its tantalizing premise of, well, Bonnie and Clyde vs. Dracula for one. That's not to say there's not some talent at work here. For one, we've got Tiffany Shepis playing Bonnie. Shepis is considered a bit of a goddess among modern B-movie fans having started out in Troma flicks like Tromeo and Juliet. She's since laterally moved herself to somewhat more interesting yet similar genre stuff like Halo 8's Godkiller series and the recent The Violent Kind. She brings a certain bravado to her role as a girl who relishes her sexual power of Clyde and enjoys a good kill. She basically owns the entire film (you can really tell that writer/director Timothy Friend had the most fun writing this character). Clyde, played by Shepis' Troma compatriot, Trent Haaga, does a good job keeping up with her and playing a whipped boyfriend. But can you blame him? If anyone could whip Clyde it would be the voluptuous Shepis. So where does Dracula come into it you ask? Through a series of botched robberies and unfortunate events, Bonnie and Clyde end up on the doorstep of evil Dr. Loveless. Dr. Loveless is this burlap sac wearing weirdo who's got Dracula in his basement and a mentally deranged sister on a zap-collar. This is where what are essentially two different kind of films smash together to a mixed bag of humour and violence that don't always gel. At its heart, Bonnie and Clyde vs. Dracula wants to play with the legend of Bonnie and Clyde more than the legend of Dracula. Depending on how much you love vampire films and were hoping for more bloodsucking than gun fighting this might bug you. I may not have bought into Friend's vision for what a mashup like this could be, but I know there are a ton of you out there who might appreciate it for the oddball indie it is.